Home » Bollywood News » Panipat actor Arjun Kapoor shares an inspirational post, girlfriend Malaika Arora's reaction will give you major couple goals! Malaika Arora the alleged girlfriend of Arjun Kapoor got all tempted when Arjun Kapoor posted and inspirational caption on his picture. Arjun Kapoor is now adays in Jaipur shooting for his first ever period drama Panipat, he is putting his all efforts to fit into the character of Sadashiv Rao Bhau, nephew of Peshwa Bajirao. He is working day in and day out to justify the role and to ace it well on screen. Admist all this, he managed to steal some ‘me’ time from his busy schedule, while enjoying his own company he posted his picture on instagaram and the moment Arjun posted Malaika couldn’t resist his emotions and left the comment on his post. As Arjun wrote, "Sun kissed & enjoying the day off... leave the worrying & the stress for another day soak in the moment, bask in ur happiness & remind yourself the journey is fluid... Sometimes you just gotta enjoy the experience of becoming..." Malaika was quick to reply, "Hmmm" . 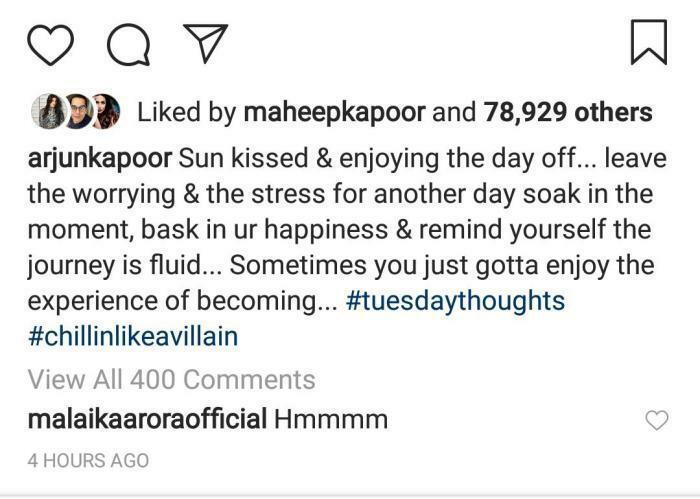 Malaika is very active on instagram and commenting ‘hmmm’ on Arjun Kapoor’s post, this is not the first time Malaika is all ‘hmmm’, in fact they seem to be sharing this 'hmm' connection. Even on the other day they happened to share similar posts on wanting to go on a vacay and went all 'hmmm' on each other's posts.